Many people strive to be productive in their daily lives. However, whether it’s due to exhaustion, being overwhelmed, or other factors, being and staying productive can often feel like a challenge. Exercise has long been shown to help increase productivity in a number of ways. 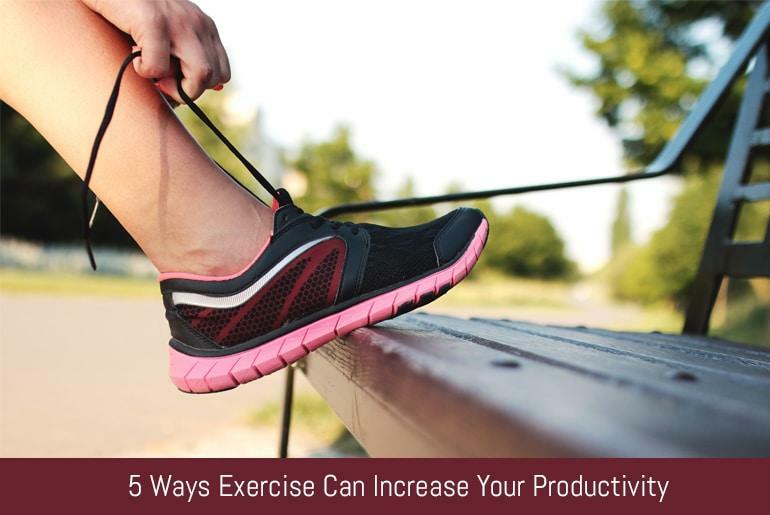 Below, we’ll look into five ways that exercise can increase your productivity. Most of us have experienced the dreaded afternoon work slump. If you’ve ever found that taking a walk helps you perk up, then you’ve seen first-hand how exercise can keep you more alert. Harvard University’s Men’s Health Watch found that exercise releases brain-derived neurotrophic factor, or BDNF. This chemical improves the function of memory circuits in the brain, which means that regular exercise can support improved memory. Men’s Health Watch noted that BDNF cannot be taken in pill form – right now, it appears that the only way to produce it is by getting regular exercise that gets you to at least 70 percent of your maximum heart rate. Many people lament that they are too exhausted to exercise. However, regular exercise allows your body to actually produce more energy over time. This is because, when you exercise, your body creates new mitochondria in your cells. Mitochondria are organelles in cells that produce adenosine triphosphate, or ATP, which is the chief source of energy in the body. More mitochondria means more ATP, which leads to more energy. The ability of exercise to increase energy is very well documented. Over 90 percent of studies in this area have found that sedentary people who adopt an exercise program have more energy than control groups who remain sedentary. In many cases, these results are more pronounced than treatment with stimulants. If your job requires you to come up with new ideas, you may periodically find yourself stalled. This can be a major problem if you’re on a deadline. The good news is that exercise can help boost creative thinking. One study published in the Journal of Experimental Psychology investigated the effects of walking (both indoors and outdoors) on creativity. The study’s authors found that walking caused an average of a 60 percent increase in creative output. The fact that walking indoors also offered creative benefit is good news for those working in offices. While a walk outside on your lunch break can be helpful if you’re creatively stuck, walking around your office or down the hall may well be enough to help you come up with a great idea. You already know that exercise can improve your memory. But a study from the University of British Columbia found that exercise creates a measurable change in the size of the hippocampus. This is the area of the brain that is involved in learning and verbal memory. One interesting facet of this study is the fact that the study authors found that aerobic exercise specifically had this effect. Resistance training and balancing exercises did not have the same effect on the hippocampus. While increasing hippocampus size is a good thing for your productivity, it’s also good news for your health, as it may help prevent dementia. While many people perform well under pressure, chronic stress can make your productivity go down. Luckily, exercise is a natural stress reliever. Because exercise releases endorphins, which work naturally as antidepressants, maintaining a regular exercise routine can keep your stress levels well-managed. This can help you stay focused and productive without the ill effects that come with long-term stress. What if You Have Limited Time? Despite the many health and productivity benefits of regular exercise, many people simply don’t exercise because they feel they don’t have enough time. However, high intensity interval training, which is commonly known as HIIT, offers a time-efficient solution. HIIT workouts involve short bursts of intense energy output followed by a short recovery period. This cycle is then repeated, usually over the duration of 10-20 minutes. This may sound like a short time frame for a workout, but HIIT has been shown in several studies to burn more calories than steady-state cardio. You can do a HIIT workout easily on a treadmill. To start out, it can be helpful to choose a shorter work interval and a longer rest interval, as this can help you acclimate to the challenges HIIT poses. You can start with a 15-second treadmill sprint, followed by walking for 45 seconds. Then, repeat that 15 times for a total of 15 minutes. Once this starts to feel easy, you can change the workout to 30 seconds sprint/30 seconds walk, and work up to 45 seconds sprint/15 seconds walk if you’re up for a challenge. If you are injured or otherwise unable to do impact exercise, you can easily do a similar workout on an elliptical machine. Exercise is an important addition to your regular routine. And with HIIT, you can get in a rigorous workout in limited time while using minimal equipment. By doing regular exercise, you’ll be able to boost your productivity at work and in your life as a whole, and you’ll also reap the myriad health benefits a good exercise routine has to offer! Eric is the content manager at Fit&Me. Fit&Me is dedicated to helping you achieve your health and fitness goals, and transform your body by offering the best fitness equipment and knowledge you need.